Meditation teacher Joseph Goldstein and Dan Harris of 10% Happier discuss how to establish the habit of sitting for daily meditation practice. Establishing a daily practice does not have to be a struggle. The most important thing to do is to just start. You don’t have to be a marathon meditator right away. As Joseph Goldstein suggests: “Pick an amount of time that you can really commit to doing every day. It is the everydayness that is going to build the practice.” Taking this attitude can help motivate you and provide the inspiration needed to carry your practice forward. Start with a manageable amount of time: Rather than diving in head first, begin with a reality check. What is an amount of time you can sit with confidence? Even if it seems small, picking an amount you know is doable sets you up for success. This means you’ll be able to meet your goal, instead of giving up halfway through and walking away discouraged. Once you feel comfortable with the length of time you picked, you can slowly add a few more minutes as you go. Pretty soon you’ll surprise yourself by what you can do. Establish habits around your practice: Goldstein notes, it’s important to aim for having a time and place where you practice every day. But when life happens, it’s also important not be discouraged if you have to shift your practice to another time or place. The important thing is that you practice every day. 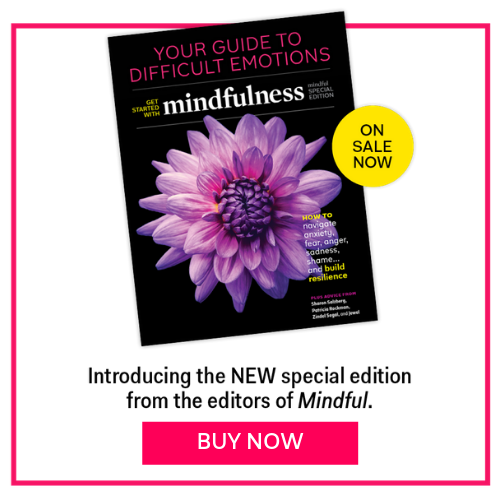 As Dan Harris shares, “I meditate in the back of taxicabs, in airplanes, in my bedroom while the kid is freaking out, in my office.” Mindfulness does not need a cushion or any special conditions. Noticing that every moment, no matter how mundane, is a chance to be mindful, is a foundational step. Mindfulness does not need a cushion or any special conditions. Noticing that every moment, no matter how mundane, is a chance to be mindful, is a foundational step. Bring your practice into your body: After establishing a time and place that works for you, you can also extend your time being mindful by taking it into the world. Mindfulness of the body (paying attention to your bodily sensations and movements) is a good way to allow mindfulness to follow you throughout the day. Pay attention to your feet on the ground, the feelings of your legs, or the position of your limbs to bring some mindful awareness to every day.